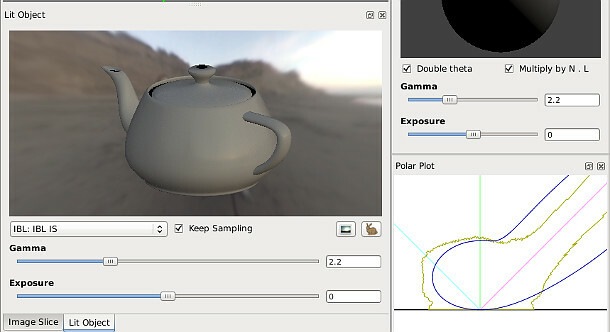 Some of the display options available in BRDF Explorer, Disney’s newly open-sourced tool for displaying BRDF surface light reflectance functions and comparing them to measurements from real-world materials. Disney has open-sourced BRDF Explorer, its tool for displaying and analysing BRDF lighting functions. Which is pretty much BRDF Explorer in a nutshell: the tool loads arbitrary BRDFs, graphs them, and enables you to twiddle parameters to see the result. As well as the graphs, you can see the data applied to a 3D model for instant visual feedback. Paul Debevec’s light probes are supplied in Ptex format along with the software, to offer more options for image-based lighting. The tool can also be used to compare synthetic BRDFs to measurements from real materials, such as those in Mitsubishi’s MERL database. The source code for BRDF Explorer was released back at Siggraph, but there is now a binary available, eliminating the need to compile it yourself. At the time of writing, it’s 32-bit Windows only.